Arunachal Pradesh Chief Minister Pema Khandu on Wednesday inaugurated the Advanced Landing Ground (ALG) at Tuting in the state's Upper Siang District for Indian Air Force's operations, an official said. The event took place in the presence of Air Marshal C. Hari Kumar, Air Officer Commanding-in-Chief, Eastern Air Command (EAC) and Air Vice Marshal Manavendra Singh, Senior Officer-in-Charge Administration, Eastern Air Command and other senior Army and Air Force officers, said an IAF release. After the Cabinet Committee on Security's approval in June 2008, Air Force embarked on an ambitious reconstruction plan to upgrade Tuting ALG along with other landing grounds in the eastern command. 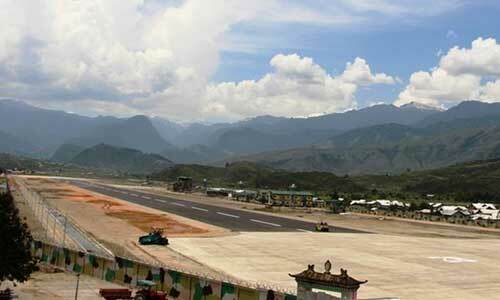 The ALG has been upgraded with a full-fledged runway and all the associated facilities. The strategic location of Tuting makes it a launching pad for the air operations and the management of border area, release added. The ALGs for upgradation include Tuting, Mechuka, Along, Tawang, Ziro, Pasighat, Walong and Vijaynagar in Arunachal Pradesh. The project is expected to cost Rs 1,000 crore. In March this year, two ALGs at Ziro and Along was re-launched. The ALG at Walong was inaugurated in October last year. In addition to the military use these airfields will gives additional capability in maintaining the vital supplies by fixed wing aircraft and helicopters besides meeting challenges during natural calamities. Director General Civil Aviation and Airport Authority of India have proposed civilian flights from Tuting.